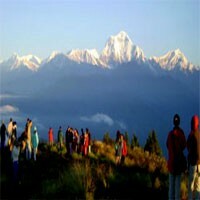 Everest high passes trek itinerary is an adventure trekking itinerary of the Everest region trek. Everest high passes trek itinerary is also known as an Everest 3 passes trek itinerary. 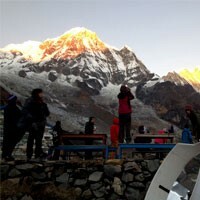 Everest high passes trek itinerary covers all the area of the Everest region. Everest 3 passes trekking is one of the best Everest trekking for the view of the Everest region. This 3 weeks Everest high passes trek itinerary covers all 3 high passes as Kongma La, Cho La, and Renjo La pass and offer the stunning views. We make customize Everest high passes trek itinerary as your order. On our first arrival at the Kathmandu Tribhuwan airport, we meet a representative from FrolicAdventure than he takes us to our hotel in Kathmandu with private transport and after our refreshment in a couple of hours, we meet a manager of the company for our trip meeting. Overnight at the hotel. Our Experienced tour guide meets us in our hotel with private transport and takes us to four world heritage sites. we visit Kathmandu Durbar Square, Monkey Temple, Pashupatinath, and Bouddhanath today and our guide briefs about these areas, culture, religion, history, art and the architecture than we drive back to the hotel. Overnight at the hotel. Day 03 : Fly to Lukla(2840m.) and trek to Phakding (2610m. )3 hrs. After about a half an hour scenic mountain flight to Lukla, we have a short break here to have a cup of hot drink and prepare the trek. We trek only about 3 hours following the forest, mountain view, crossing suspension bridges, and the traditional villages, we reach Phakdaing. Overnight at the lodge. Today the second day of our trek and it is bit long day takes about 6-7 hours including 2 hours climb. After walking about 3 and a half hours walking by crossing 3 suspension bridges on the same river, we reach Jorsalle where we stop for the lunch. after our lunch, we cross two bridges including the highest bridge. We ascend through the pine forest for 2 hours to Namche Bazaar. Namche Bazaar is one of the most beautiful towns in the Everest region trek. Overnight at the lodge. Day 05 : Explore day at Namche bazar for acclimatization. After this place, we go to the higher areas so we need to have an acclimatization day in here. We hike up to the Everest view hotel viewpoint passing the Syangboche airport. We see the scenic Everest massif including the world's highest mountain Everest and the most beautiful mountain Amadablam. we have some hot drinks in the Everest view hotel with superb view and hike back to Namche Bazaar. Overnight at the lodge. Day 06 : Trek from Namche to Tengbuche (3860m. )5 hrs. We trek on the mountain highway which made by an old local man to whom we can see along the trail. We pass some beautiful stupas with the same view of the mountain which we would have been seen from the Everest view hotel until the place called Kyangjuma. We reach Sanasa and the trail divides to Gokyo and the Everest base camp sides from here than we trek all the way to the river down to Phungkitenga. We have our lunch here than ascend to Tengboche through the rhododendron, pine and other forests. We visit the Tengboche monastery in Tengboche. Overnight at the lodge. Day 07 : Trek from Tengboche to Dingboche (4410m. )5 hours. Today is an easy day of our trek with a stunning view. We trek to downhill to Deboche and walk on the flat trail inside the forest. Now we cross a bridge with the great view of the Amadablam mountain and ascend for a while until Pangboche and Somare village. Crossing Somare, we have an easy trail and we take to the right trail to Dingboche. Overnight at the lodge. Day 08 : Trek from Dingboche to Chhukung(4730m. )3 hrs. We have one of the shortest days of our trek today. 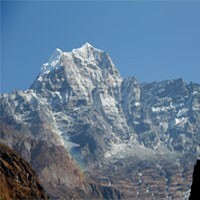 We only walk 3 hours on the easy trail with the view of Amadablam, Lhotse, Island peak and others. We follow to the Imja valley and arrive Chhukung. We hike a little bit higher for our acclimatization walk towards Chhukung Ri and come back to Chhukung. Overnight at the lodge. Day 09 : Trek from Chhukung to Lobuche(4910m.) via kongma la (5535m. )8-9 hrs. Today we have the highest pass of our three passes trek. We steeply ascend about 4 hours to the top from where we see the stunning panoramic view of the mountains and the Khumbu glacier. after taking some pictures from the top and have our pack lunch, we start descending towards Lobuche. We cross the Khumbu glacier before reaching Lobuche. Overnight at the lodge. Day 10 : Trek from Lobuche to Gorakshep (5140m.) and hike to Everest Base Camp (5364m. )8 hrs. in total. We make the base camp of the highest mountain in the world today. We have an early breakfast and start early and trek to Gorakshep by passing glacier and Lobuche pass. It takes around 3 hours to Gorakshep and we have some quick lunch than the hike to the Everest base camp. After our celebration of the being at the base camp, and taking some photos, and hike back to Gorakshep. The hike from Gorakshep to Gorakshep takes about 4-5 hours. Overnight at the lodge. Day 11 : Hike to Kalapatthar(5545m.) and trek to Dzongla (4830m. )6 hrs. We hike in the early morning to Kalapathar to see panoramic 360 degrees Everest mountain view and very close view of the Everest. Hike to the top of the Kalapathar takes about 2 hours. We take some shots from the top and hike back to the lodge. Here we have our breakfast and start our trek to Dzongla via Lobuche. We trek with the beautiful mountain view and Cholo lake. We may see some group of the yaks along the trail to Dzongla. Overnight at the lodge. Day 12 : Trek from Dzongla to Thaknak (4700m) via Cho La Pass (5360m. )7 hrs. We trek with the flashlight after an early breakfast at the lodge here towards the Chola pass. The trail is rocky and falling the rocks after the sun heat. After crossing the rocky path, we walk on the sleepy icy trail just before the top. Here we take some photos and trek down with rocky path again. It takes about half an hour to cross the rocky path then we have nice, clear and the easy trail downhill until we reach Thangnak. Overnight at the lodge. Day 13 : Trek from Thaknak to Gokyo valley (4790m. )3 hrs. and visit 5th lake(4990m. )5 hrs. Today we cross the biggest glacier of the Everest region after Thangnak to Gokyo. we trek about 3 hours to Gokyo. We have our lunch and hike to the fifth lake or 4th lake according to our time or just hanging around Gokyo by enjoying the view of the lake and mountains. Overnight at the lodge. Day 14 : Hike to Gokyo RI (5360m) and overnight at Gokyo. Today we hike to Gokyo Ri which is the most beautiful views in the Everest region. We see the stunning mountain view all around us from the top after 2 hours of our hike. The bigger part of the Everest, Lhotse, Makalu, and Cho-Oyu high mountains above eight thousand meters can be seen with hundreds of the other mountain from the top of Gokyo Ri. We see the lakes, huge glacier and the Gokyo valley downwards from here and hike back to Gokyo. Overnight at the lodge. Day 15 : Trek from Gokyo(4790m.) to Marulung(4210m.) via renjo la pass(5360m. )7 hrs. We start the earlier trek in the morning to cross the Renjola. Renjo La top has a similar view as from Gokyo Ri. It takes about 3 hours to be on the top. Renjola is one of the easiest passes among other high passes. After the pass, we trek down with a great view and pass one small lake. After a long downhill, we reach Marulung. Overnight at the lodge. Day 16 : Trek from Marulung to Namche bazar(3440m. )6 hrs. We pass the hidden valley Thame after our few hour treks where is the oldest monastery of the Khumbu region. we may have quick visit the monastery and trek to Namche crossing the village Thamo. The trek to Namche is nice and quite. we may see some Nepali national birds along the trail to Namche. Overnight at the lodge. Day 17 : Trek from Namche bazar to Lukla (2840m. )6-7 hrs. The trail to us today is usual that we have been passed a few days earlier. We trek downwards through the pine forest and cross the same five bridges before reaching Phakding. We stop for our lunch in Phakding than we trek another 3 hours to Lukla. We may visit the bars and the coffee shops where we celebrate the last night of mountain stay. Overnight at the lodge. Day 18 : Morning flight back to Kathmandu and have farewell dinner with the company. This is the day that we come back to the city to a noisy place. We transfer to the hotel and be fresh. We have the farewell dinner with Frolic Adventure this evening. Overnight at the hotel. Day 19 : Leisure day and shopping. We may have some other heritage tour or do souvenir shopping for the friends and family today and hang around Thamel. Overnight at the hotel. Frolic Adventure takes us to the international airport with private transportation and says goodbye until our next visit.